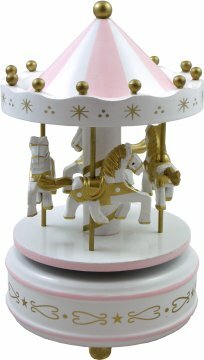 This delightful musical carousel has four miniature horses that gently go round as the music box plays a charming melody. Hand painted in white with pastel pink & gold highlights. An enchanting keepsake music box that is sure to delight. We can custom fit a tune of your choice from the menu below for an additional fee. To hear custom tune samples, click here. Please be aware that these are not toys. They are made of a fragile moulded resin & contain small parts.